Into the top half of our favourite songs of the year. Here are tracks 50 through to 26. Murder By Death have built a career on gothic country rockers and sun-baked desert folk, yet even after all these years they still manage to surprise and True Dark is them at their twangiest best. The second entry for Fontaines DC. The band’s latest single, Too Real is another storming track of undeniable power and swagger that just begs to be played loud, and on repeat. Is there anyone else who can make melancholia sound so stunningly gorgeous? No One Changes is an introspective, sombre beauty, as elegant as it it fragile. Creating era-blending Americana-infused rock & roll with a more indie rock vibe, rollicking, anthemic single The Danger of Belief was made for a long straight highway with the windows down and the volume up. A highlight from his most recent album, One trick Ponies has all the trademark Kurt Vile ingredients: woozy guitar lines, mumbled stream-of-consciousness lyrics, sly humour and a touch of the surreal. But this is a generous, big-hearted song and the hazy sheen he coats it in just adds the prefect amount of gentle bonhomie. Almost without noticing Cass McCombs has become one of our most influential and important songwriters. Sleeping Volcanoes, the thematic centrepiece of his upcoming album, is a delight of pensive, dreamlike rock, albeit anchored by a rumbling groove and his world-weary vocals. Aside from the netball connotations, Aussie duo Wing Defence delivered a sublime single of indie pop with Stuck, the infectious melody is of major earworm quality, and shot through with a core of wonderfully bitter lyrics. The pulverising riffing and chanted lyrics of Castle Spell combine into a freakbeat spectacular of psyched-out space rock – like Silver Machine on speed. Rifles & Rosary Beads was an album that was four years in the making, it is a collaborative record in the sense that the eleven songs were co-written with wounded veterans in the SongwritingWith: Soldiers retreats. Taken from the album, the heartbreakingly poignant and evocative The War After The War, with its gorgeous violin backdrop and insistent guitar had one of our favourite opening verses of any song we heard this year. who care for the ones who went to war? Awash with a swirling riff and Thor-like percussion, Disaster (Is What We’re After) is a churning, boiling psych-punk rocker that rides its undeniable, repetitive groove like a drunken cowboy at a rodeo. DBUK, a side project of Slim Cessna’s Auto Club will return early in the new year with their second album. The first single In San Francisco Bay is a southern gothic four-de-force. Hypnotic, mesmerising and menacing – think of it as the musical equivalent of a naked preacher sat in a box full of venomous snakes. Described by American Wrestlers (aka songwriter Gary McClure) as “a weird little country song with hokey lo-fi strings that bent into black memories“, Ignoramus is all that and more – in fact we’d go as far as to say it is a snidely understated masterpiece. Over Again is classic British folk story-telling. Hurtling along on the back of an irresistible melody, it begs to be sung along to (and there’s even room for some handclaps). Paradiso from brilliant Anglo/US/Swedish noiseniks FEWS was yet another example of their slashing, incandescent guitars and ferocious, pummelling percussion. We’re allowing Polly Pocket this one… a multi-faceted tune of bright, crisp synths, ethereal backing vocals and relentless, unforgiving drums that call to mind Disintegration era Cure. A gently insistent folk song complete with the duo’s trademark tender harmonies and sense of bruised heartache. It is an absolute gem of a tune. A brilliant debut album and a brilliant rolling track of jangling guitars and driving motorik percussion. The Rover opens with ringing guitars and percussion taken directly from Krautrock’s halcyon heyday. It is a relentless, menacing rush of pure rock’n’roll. Where would we be without a good murder ballad? This is classic country story-telling given a contemporary twist as Gretchen Peters brilliantly sketches a tale of a woman driven to desperate measures to protect her little sister from a predatory male. Ever since the brilliant Stoned and Starving, Parquet Courts have shown an uncanny ability to create some of the catchiest, toe-tappers around, whilst still managing to diversify their sound into new genres and styles. Tenderness is up there with the best of them – surprisingly slinky, jaunty and knowingly insecure, “Like a junkie going cold, I need the fix of a little tenderness“. We can all relate to that. Check out tracks 100-76 here, and 75-51 here. The Smoking Trees – Who Is The Villain? Kurt Vile has shared a video for Loading Zones, which collaborations apart, it is the first new music to surface from him since 2015. The video is a paean to his City of Brotherly Love, and a farcical tribute to the song’s lyrics, themselves an account of Vile’s peculiar parking strategy. “I park for free!” he proclaims, as he goes about his day moving his car from one loading zone to another, narrowly avoiding parking tickets and irate meter maids played by Kevin Corrigan (Superbad, The Departed, Goodfellas) and Matt Korvette (frontman of Pissed Jeans). Mad Mackerel is ten years old. Who would have believed it. So, thanks to everyone who has ever visited the blog, listened, commented, submitted music, sent e-mails, sent CDs, t-shirts and even vinyl, and given us a guest list pass. We really do appreciate it. Thanks too to our regular contributors over the years – too numerous to mention all, but extra special thanks to the sprats (of course), Barry-Sean, Polly Pocket, Dr Roddy, The Italian Job, Chris T Popper and the fishily fabulous Mrs Mackerel. And most of all thanks for letting us discover some truly great tunes. 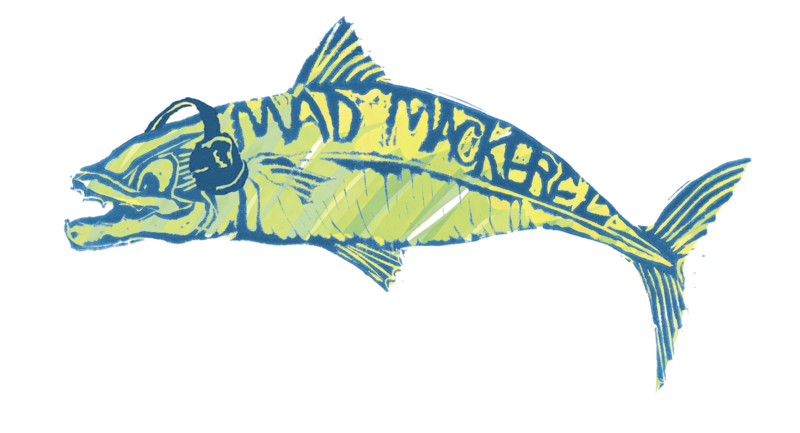 Here are ten of them – our favourites of the past ten years of Mad Mackerel. Untarnished, unpolished, unadorned. Heavy on rhythm, accordion and piano. Frankie’s Gun is a stomping, beer-swilling square dance with the grim reaper hovering in attendance. This brilliantly evocative song packs enough into three verses and a beer-hall singalong chorus to create its own Netflix series. Unhinged list of over-the-top romantic promises set to a loose, funky bassline and with a subtle, gospel style shuffle that is simply sublime. A darkly pensive tale of multiple murder that emerges from Dylan’s shadow to tramp from the bright lights of LA to the desolation of the prairies and the desert in search of more victims. Black River Killer drips with the authentic haunted quality of an old, gothic murder ballad and we can’t give it higher praise than that. Buriedfed is anguished circular verses of regret, dependency and death, slowly building up from the twang of a lone acoustic guitar to soundtrack a rollicking daydream of Robinson’s own death and ensuing funeral. The unbearably poignant and dark tale of Côte d’Azur – about those memory markers that resurface in the depths of your dreams and the half way stage when the sun warms your face, and what’s real and what’s not – the journey and the destination – merges into one; always searching. This song breaks my heart at every single listen, so I turn up the white noise. A seamless fusion of country and classic rock, with just a hint of punk’s reckless abandon. Kicking off with a great riff and whiskey raw vocals, this wonderfully ramshackle Americana is like musical heroin. So, it takes Kurt a little while to recognise himself as the “man in the mee-rah”. Wakey, wakey son. But after a minor identity crisis and a bit of a teeth mix-up, everything’s pretty pimpin. It is a fingerpicked earworm where a sprawl of twangy guitar and surreal, laconic lyrics combine to create the perfect ode to stoned self-reflection, and a very well-loved tune amongst Team Mackerel. With rumbling percussion, echoing guitars and an almost reggae-like rhythm, Willy Mason announced his return after a five year hiatus with this outstanding tune, a dusty, world-weary hymn to moving on. Swaying along to this beauty in a large field clasping an overpriced (but comfortingly strong) cider is what summer should be all about. Shared a cigarette for breakfast? More than one I reckon. John McCauley of Deer Tick has a voice that was made for this song. One for the road, sung in chorus, gives me the warmest, fuzzy feeling all over. Stick me on a greyhound bus with Middle Brother playing to the open road and I reckon I’d be a happy girl. Just about the best darned cover (yes, I know but don’t care) I ever heard. Pure magic. It is Matthew Houck’s ragged, yet fragile vocals that stitch together Zula’s imagery, which cuts far and deep. Intensely poignant lyrics, sweeping strings, pulsing drum machine: it all weaves together to form an emotional testament to the end of a relationship. Ever had your heart broken? This is what it feels like. So there we have it, 200 of our favourite songs since 2008. Everyone a gem, everyone a memory. Enjoy! Check out the full countdown here: 200-181, 180-161, 160-141, 140-121, 120-101, 100-91, 90-81, 80-71, 70-61, 60-51, 50-41, 40-31, 30-21 and 20-11. Pretty much figure we’ve all been waiting to hear this… Over Everything is the first fruits of the collaboration between Courtney Barnett & Kurt Vile and is taken from the forthcoming album Lotta Sea Lice. And so as we head north to Mackem country here are 8 songs to keep you company over the weekend. All lovingly culled from the week’s new releases for you and including songs from Hope Sandoval & The Warm Intentions featuring Kurt Vile, Greys, MV & EE, Honeyblood, Luxury Death and the incomparable Leonard Cohen.